Are you a Bath & Body Works shopper? 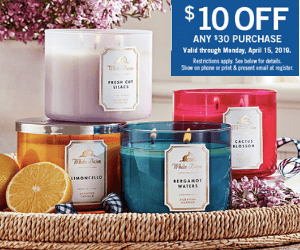 This is your chance to save big at Bath & Body Works this weekend! Claim your coupon today and save $10 off your purchase of $30+. Plus, 3-wick candles are only $13.95 for a limited time. Print the coupon or show it on your smartphone at the store. The coupon is valid until Monday, April 15th.